The year 1999 was a milestone for the maritime industry in Curaçao as it reached a point where infrastructural expansion was required in order to meet berthing demand. The first Megapier was constructed and could hold all large vessels at the time. The location at Rif was the ideal choice for such developments as it surpassed the required depth, was in the downtown area and allowed for future expansion. Since then the maritime industry in Curaçao has seen great growth, especially in the cruise sector. Call requests reached a level where the Curaҫao Ports Authority could no longer meet demand, especially during high season. To provide the needed flexibility and framework for continued growth of the maritime industry, CPA planned for an expansion of its facilities. Many options were considered and all stakeholders were consulted, leading to the development of the Rif Seaport Curaçao Master Plan, which was unveiled in July of 2014. The newly expanded Rif Seaport Curaçao will enhance the island’s ability to welcome guests to a vibrant and entertaining waterfront. The Rif Seaport Curaçao development is dedicated to provide a fun and memorable experience for cruise visitors from arrival to departure. Through the development of a second Mega Cruise Ship Pier, the island will be able to welcome more frequent calls by larger cruise vessels. Guests will enjoy improved linkages, from well-functioning ground transportation zones and expanded pedestrian plazas and sidewalks to the island’s entire destination offering. The Rif Seaport extends the richness of the island’s architecture and culture, creating a place where visitors can experience the vibe, rhythm and flavors of Curaçao. With a spacious open-air design, guests can enjoy the sun and Caribbean breeze while planning a tour adventure, sipping a local cocktail or browsing the goods available at the marketplace. The planned Rif Seaport is located in the historic Otrobanda district of Willemstad, west of the St. Anna Bay Channel. The site includes the current Mega Cruise Ship Pier and lands to the west, bringing cruise passengers within walking distance of Willemstad’s varied touristic offerings and notable UNESCO World Heritage protected downtown and neighborhoods. The project area acts as a natural extension of Curaçao’s cruise tourism infrastructure, extending and improving upon current pedestrian pathways, vehicular and logistical zones. The Rif Seaport is also a short drive from the Hato International Airport (9 kilometers) and close to many of Curaçao’s signature resorts. Through its diversity, year-round programming, and interconnected public spaces, the Rif Seaport Curaçao will provide a vibrant welcome to both visitors and locals. The Rif Seaport is comprised of three interrelated components. The new, second Mega Cruise Ship Pier will welcome cruise guests and bring them to a new arrivals area connected to the waterfront promenade, ground transportation areas, and Rif Seaport Village. The Rif Seaport Village offers a dynamic retail, food and entertainment experience for guests and island residents. Arranged along the project’s main waterfront promenade, it offers retail shops, an open air marketplace focused on local crafts and culinary offerings, waterfront food and beverage establishments and a sequencing of entertainment elements. Linking the Rif Seaport Village and the new pier is the centralized ground transportation area providing over 35 bus positions for scheduled and independent tours. This arrangement allows for maximum utility and flexibility for tour operations. With the exception of the passenger arrivals building and piers, all areas are open to the public. The Rif Seaport Curaçao is organized around a wide waterfront promenade, meeting guests at each of the arrival points and leading them through the project’s varied components and the various Willemstad and island offerings. The promenade is punctuated by waterfront vistas, plazas, and quaint pedestrian shopping streets all working together to create a harmonious environment designed at the human scale. Buildings range in height from one- to two-stories, creating enclosure around key arrival areas and plazas. Building placement works to emphasize key sightlines to and from cruise ships, ground transportation areas, and main pedestrian ways. This also will provide a high degree of visibility for retail and marketplace businesses. Buildings, awnings, canopies and landscape elements are situated to buffer main plazas from wind and provide shade for guests. The architectural theme for all project buildings is a blend of traditional Caribbean Dutch form with other more contemporary indigenous elements to create a place that feels familiar yet distinctive in the overall Willemstad area. Building colors are cool and muted, favoring shades of white and lighter tones, with patios, awnings, shutters and doorways. On the groundplane, hardscape elements have more vibrancy and patterning. 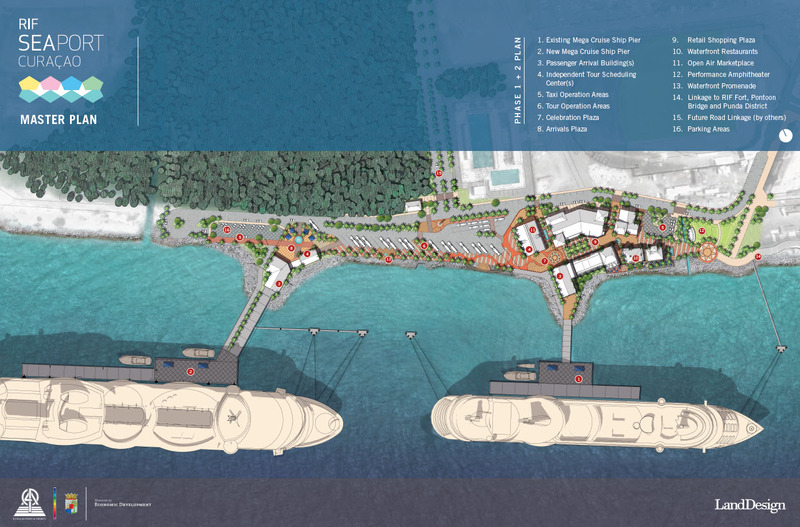 The Master Plan calls for the development of the Rif Seaport Curaçao in two phases. Phase 1 includes the creation of the Second Mega Cruise Ship Pier and adjacent upland connection point, passenger arrivals building and plaza, ground transportation area, and pedestrian linkage to the current cruise site and Willemstad beyond. Phase 2 advances the Rif Seaport Village and related ground transportation and logistical zones as well as an expansion of pedestrian facilities and infrastructure. The area furthermore lends itself to expansion depending on market needs.